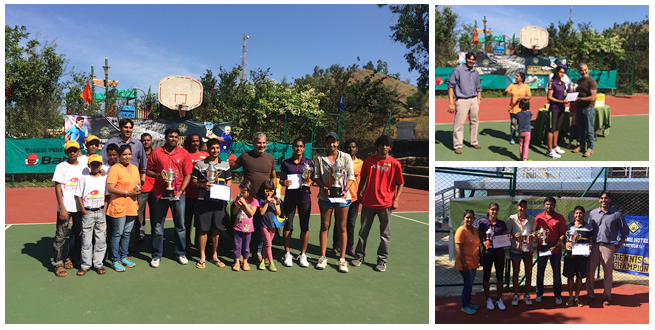 On a successful note a Men & Women’s Tennis Tournament has just concluded at Ravine Hotel, Panchgani which was held from 17th November to 21st November 2014. The event was organized by the Ravine Hotel, located among the beautiful valleys of Panchgani, under the auspices of the Maharashtra State Lawn Tennis Association (MSLTA) & All India Tennis Association (AITA). Ravine Hotel has been hosting major tennis tournaments since the last 10 Years. With state-of-the-art facilities, making it a perfect choice for hosting these tennis tournament, officials of Ravine hotel and MSLTA/AITA ensured that the tournaments was successfully carried out. The Prize money of Rs 1,50,000 drew Men and Women from all corners of the country, with over 150+ players from the Opens division, some of India’s Top ranked professionals who have aspirations to make it on to the world stage.